The Beauty of Life: It's My Birthday, and I'll Write if I Want to. It's My Birthday, and I'll Write if I Want to. Me, celebrating my birthday yesterday at Pounds and Ounces in Chelsea. As I write this, I'm sitting on a plane to Los Angeles. (God bless Wifi, however slow it may be on this Virgin flight.) And I'm reflecting on the year past and concentrating on the year ahead, because today is my birthday! It was also recently the 6th anniversary of this blog, which feels unbelievable -- it's really hard to remember a time when I didn't do this, or imagine a time when I wouldn't want to. I'm extremely grateful for all of my lovely readers (read: you! ), without whom I would probably still be doing this, but it wouldn't be nearly as much fun. This past year of my life was, admittedly, not the best. I had a lot of health issues, including months of physical therapy to heal a hurt shoulder. I suffered the daily struggle of New York life as I tried to figure out just how exactly I was supposed to pay my rent and all of my bills while freelancing and paying my own medical insurance. I lost some friends who had been very close to me, which, no matter how old I become, still stings. But the best thing that happened to me is that I realized things can only improve from here. 32 was my least favorite year yet, but that means there's so much room for my life to get better! And the coming year promises to bring many exciting changes, which I'm keeping under wraps for now but will be revealed in due course. In any case, I'm extremely excited to see what is down the road and to embrace 33 for everything it has to offer. Blowing out the candles on my cake on my 8th birthday. Note the dress with the matching headband. And HOW did my hair get those amazing beachy waves? 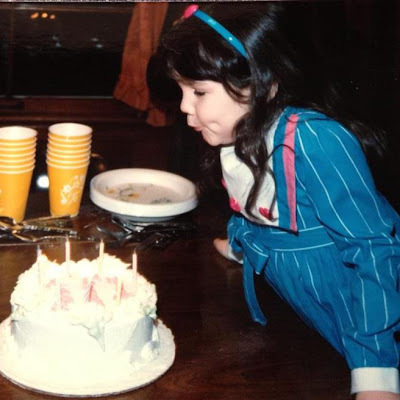 It doesn't really feel like I'm that much older than the little girl in the picture above, blowing out the candles on her birthday cake and making a wish. (For the record: I'm eight years old there.) I truly can't believe 25 years have passed since that photo was taken! Time really does fly when you're having ... well, fun, and sometimes heartache, but it does just tend to fly in general. I want to extend a heartfelt thank you to everyone who reads this blog -- I truly appreciate you! And, to be truly self indulgent ... happy birthday to me! Long time reader here. I don't usually comment but wanted to wish you a very happy birthday!! :) I look forward to all the wonderful changes you have in store. Happy Birthday!! I hope you have a wonderful year.